To study abroad is definitely an adventure of a lifetime and I can only imagine how exciting that can be. But before you can even begin this new milestone, there’s one dreadful task you need to tackle first – the packing! Packing for a holiday is already mentally and physically exhausting. How much more for a semester or more in a foreign country? If you have empty suitcases staring at you right now, don’t worry, because I’ve put together a list of what to pack for your study abroad. You can forget the rest but not these! Never leave without your passport, visa, plane ticket (printed copy), debit/credit cards, health insurance cards and school documents. Make sure to make photocopies of your important IDs in case they get lost or stolen. Here comes the fun part – your clothing items! But I’m sorry that you can’t bring your whole wardrobe with you. So you need to adapt the “minimalist” thinking when you are packing for you study abroad. Just pack a few basic seasonal clothing pieces and footwear. So make sure to research the average temperatures during your stay, as well as their traditional culture and customs. I also suggest for you to pack at least one formal outfit in case of events, a swimwear and rain-wear. Keep in mind that you are there to study and not put on a fashion show. And besides, there’s always a little room for shopping. For holy grail items you can’t live without (like skincare for example), check online if these items are available in your destination. If not, then you can bring the full-size with you (plus some back-ups). Otherwise, just pack travel size toiletries that will last you for at least a week (especially your deodorant, feminine products for the ladies and shaving essentials for the guys). If you are taking prescription meds, ask your doctor for a 6-month supply (or till when you will be able to go back home) and stock up on all sorts of emergency medications – allergy, fever, cough, diarrhea, nausea, pain meds and the like. Looking after yourself when you’re sick is hard, and it’s even tougher when you have to run to a foreign pharmacy where people can’t even understand your language. So it’s better to have emergency meds on hand. Not all outlets are made equal. So make sure to bring a universal adapter so you can still use your electronics even when the outlets are not the same with what you have at home. Make sure it has multiple slots and USB ports as well. A little something from home. Homesickness is one of the many things that you should prepare yourself for when you study abroad. And it helps to have a little piece of home while you’re away… like photos of your family and friends, a small pillow to cuddle with, your favorite snacks… or anything that you think will give you a little comfort whenever you miss being home. So yeah, these are the essential items you need to pack for your new journey. 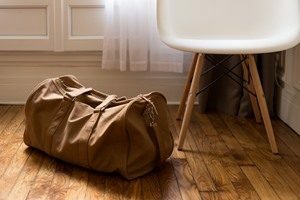 Remember that a practical and minimalist mindset when packing will make settling abroad much easier and less complicated.